Melt 1 tbsp butter in a large pan over a low heat. Add the shallots and cook until they are soft but not brown, about 4 to 5 minutes. Add the butternut squash, garlic and thyme. Cook for 5 minutes, stirring frequently, without browning. Add the chicken stock and bring to a gentle simmer. Season to taste. Cook covered until the squash is tender but not falling apart. Remove the garlic and thyme. In a medium frying pan, melt the remaining 1 tbsp butter over medium-high heat. Add the mushrooms and sauté until soft. Season to taste and add to the squash mixture. Preheat the oven to 400ºF/200ºC. Heat the oil in a large nonstick frying pan that can go in the oven. Season the sablefish and place in the pan, skin side up. Cook without turning for 3 to 4 minutes until the fish is lightly browned around the edges. Place the frying pan in the oven and cook the fish for 7 to 10 minutes until cooked through. Re-warm the sauce mixture and add the lemon juice, cherry tomatoes and sage. 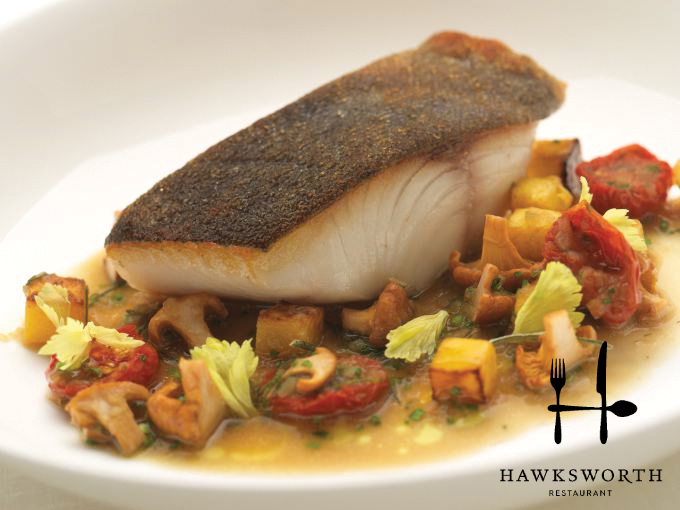 Spoon into warmed bowls and top with the sablefish. Serve immediately.